A stunning dark blue cashmere pashmina that just goes with so many outfits. 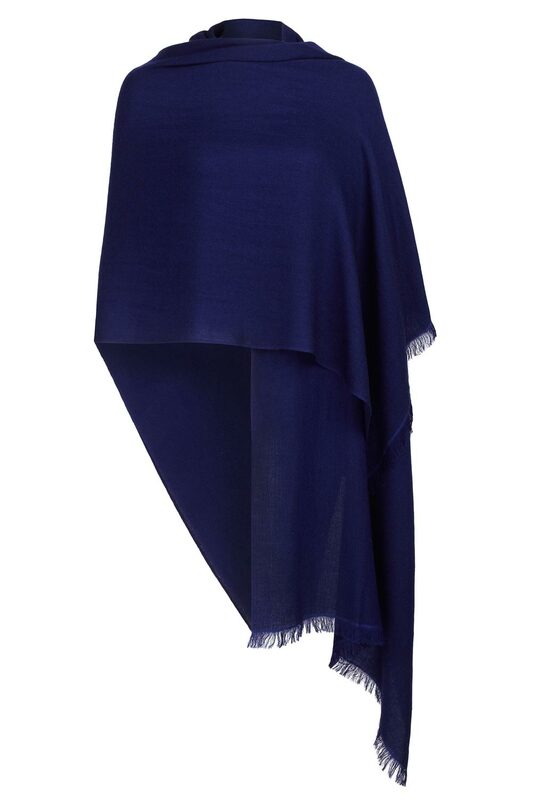 Soft and fine yet warm - this midnight blue pashmina is the perfect accessory for those cooler summer days and evenings. Worried about feeling chilly? And you want to look great too! Stay warm, look cool in a 50% Cashmere 50% Silk pashmina. Light and fine yet warm this midnight blue cashmere pashmina shawl wrap scarf is ideal. Offering great value-for-money the cashmere and silk yarns breathe whilst giving warmth. Ideal as a wedding pashmina shawl wrap scarf and for other formal occasions, this midnight blue pashmina shawl wrap scarf can be worn in so many ways. The ideal accessory. Our popular midnight blue pashmina shawl wrap scarf in 50% cashmere and 50% silk. Stay Warm, Look Cool. Comments: Good quality product and speedy delivery. Comments: Excellent service. Lovely colours and colour swatches make choice easy. Comments: Fast & efficient delivery. Expertly packaged. Good quality, as described. Lovely material and great size. Comments: It was easy to order, punctual, well wrapped and packaged - which meant it arrived it in a perfect shape. Just as I imagined it to be - lovely material and great size. Comments: First class service in terms of well-presented, informative website that's easy to use and straightforward to select and pay for one's choice of the wonderful pashminas. Quality, colour, easy to drape in a multitude of styles. Comments: Dispatched very promptly and arrived on time. Beautifully packed and well protected. Very soft and colour exactly as expected as used the excellent swatch service prior to purchase.